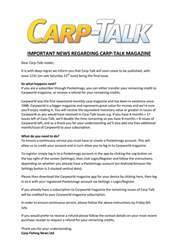 This week’s issue of Carp-Talk (issue 1029) is available to download now. 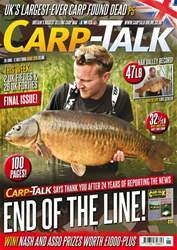 We look back at the first of the British Carp Angling Championship semi-finals, Lewis Clayton jumps at the chance to fish the legendary Birch Grove, and Dave Finn bags a brace of thirties while trying out a new braided hooklink material. Rich Wilby enjoys some short-session summer fun, Kieran Lack explains how looking at his own angling strengths and weaknesses helps him catch more fish, and Luke Griffiths finds success using an old method on a new venue. 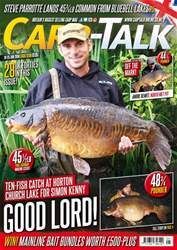 Products from Nash, Shimano and Korda go under the spotlight in ‘Trade Talk’, Ian Russell spends a night on Kingsmead One, and Nigel Sharp tackles down to maximise his catch rate. 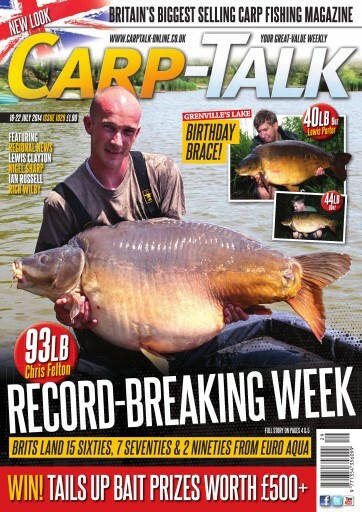 We also look at four venues worth considering for a future session in ‘Where to Fish’. 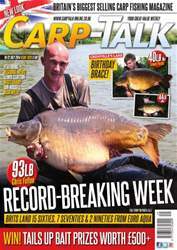 The Fox-Mainline Carp Angler of the Year competitions continues, and there is £500-plus of Tails Up Pro Seed bait to give away.